Colossians 1:2 to the saints and faithful brothers in Christ at Colossae: Grace to you and peace from God our Father, and the Lord Jesus Christ. ko-los'-e (Kolossai, "punishment"; the King James Version Colosse): A city of Phrygia on the Lycus River, one of the branches of the Meander, and 3 miles from Mt. Cadmus, 8,013 ft. high. It stood at the head of a gorge where the two streams unite, and on the great highway traversing the country from Ephesus to the Euphrates valley, 13 miles from Hierapolis and 10 from Laodicea. Its history is chiefly associated with that of these two cities. Early, according to both Herodotus and Xenophon, it was a place of great importance. There Xerxes stopped 481 B.C. (Herodotus vii.30) and Cyrus the Younger marched 401 B.C. (Xen. Anab. i.2, 6). From Colossians 2:1 it is not likely that Paul visited the place in person; but its Christianization was due to the efforts of Epaphras and Timothy (Colossians 1:1, 7), and it was the home of Philemon and Epaphras. That a church was established there early is evident from Colossians 4:12, 13 Revelation 1:11; Revelation 3:14. 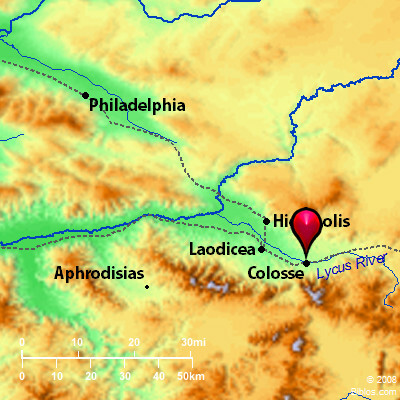 As the neighboring cities, Hierapolis and Laodicea, increased in importance, Colosse declined. There were many Jews living there, and a chief article of commerce, for which the place was renowned, was the collossinus, a peculiar wool, probably of a purple color. In religion the people were specially lax, worshipping angels. Of them, Michael was the chief, and the protecting saint of the city. It is said that once he appeared to the people, saving the city in time of a flood. It was this belief in angels which called forth Paul's epistle (Colossians 2:18). During the 7th and 8th centuries the place was overrun by the Saracens; in the 12th century the church was destroyed by the Turks and the city disappeared. Its site was explored by Mr. Hamilton. The ruins of the church, the stone foundation of a large theater, and a necropolis with stones of a peculiar shape are still to be seen. During the Middle Ages the place bore the name of Chonae; it is now called Chonas. COLOS'SE, a city of Phrygia on the river Lycus, a branch of the Meander, now uninhabited ruins. Nearly 400 ms. n.w. of Jerusalem.